It's with great delight I welcome you to the eight edition of SteemMag, a weekend digest for Steemians. Every weekend, I take a look at some of the most important topics on Steemit and also reach out to top Steemians who have expert views on such topics. This week, I will be taking a look at one of the most important topics that has been on the minds of steemians – The user retention rate. Several posts have been written positing different opinions about the true nature of Steemit’s user retention rate. Is it declining, stable or increasing? In a quest to give the true situation of things @dantheman released a post containing data parsed from the blockchain that gave a positive outlook on the situation of things. There are several factors affecting the user retention rate. Dissatisfaction of new users is a key one. To stop this, a number of projects are being undertaken by various Steemians. SteemMag had a chat with @gavvet – The top ranking Steemian who has been tracking Steemit’s website data for months now. In page 2, to conclude the superchargers of Steemit series, we had a chat with a co-founder of Blockpay. You've had a series of really low payouts. At what point did you decide not to give up and stick to Steemit? You've been tracking Steemit's user growth and retention rates for 3 months now, what is your overall impression of the current state of steemit? And what are the most salient improvements you've noticed? From my perspective I feel that Steemit is a little ahead of the curve... I think the lower STEEM price is a good thing as it is allowing the site to undergo a period of much needed consolidation. Steemit as a concept and its perception in the marketplace is still very immature. From my own featuring experience and behind the scenes in the curie project it’s great to share the experience of an author finding meaningful rewards below their content for the first time and knowing you had a small something to do with it, especially when they know nothing of all the behind the scenes involvement. A major feature of your presentations has always been the user growth among different continents. Which continents (and country) have been the biggest gainers and losers? Europe is pretty static and the rest of the world picture is very static. What are those things that can be implemented (UI and otherwise) to improve the 'stickiness' of the site and boost user growth? I think that there are better heads than mine that would be able to answer this question but I think boosting user growth is not necessarily what’s required at this stage. I think what steemit needs most before it embarks on aggressive growth is a large “middle-class”. After all it is a very active and growing middle class that drives real economic growth in economies in general. Since steem is an “alternative-economy” experiment it’s going to have its growing pains and it’s hard to predict what will emerge and at what rate as it evolves. Thanks @gavvet. For taking the time to have a chat with steemMag. And for the graphs too. Very enjoyable although minor hiccups do occur here and there. Everyone is putting in some very long hours but when the authors DM us to thank the team it kind of reassures us that we are doing the right thing. What have been the challenges you've faced so far in the drive to reward deserving authors? One of the main challenges is digging through all the content. There are thousands of posts being published daily and it's even harder when the majority is stolen from elsewhere. Another of our main challenges is curating 24/7. We currently have a slight pause of around 6-8 hours during the evening (EU time) when only one of our curators is online and a second is needed to verify the content and approve. We have had a few people that use bots with RHW express there concerns about this pause and we will be solving it hopefully by tonight by allocating a seperate shift. Which areas would you like to see further improvements on Steemit? Distribution needs to be evened out so more whales and dolphins are curating. This would solve the second problem of retention as most authors par a few whale-botted and celebrity users are raking in most of the rewards. Whats next for the robinhoodwhale project? We are internally talking about creating a "Daily Featured Authors" series to grow RHWs SP while also rewarding the authors with more SD. We also have a "long-shot" idea of making Robin Hood Whale a witness. While we do understand 66000 MVests is a very improbable target in terms of votes for being a witness, without very big whales (witnesses) upvoting us. Thanks @repholder ( @robinhoodwhale ) for taking the time to do this. SteemMag wishes you all the best. What motivated you to start Project curie? Project Curie developed organically. A group of Steemit writers came together to discuss common interests. It turned out that the main interest we had was getting rewards to some other people besides just ourselves. We were concerned that Steemit was not rewarding undiscovered and emerging authors. So we decided to pool our own votes on certain posts that the group liked. And then when the opportunity arose to channel some whale votes to those same posts, we jumped on it, realizing that we could bestow some more meaningful rewards. Soon, our whale friends trusted our work and our process, so they allocated more votes to Project Curie. I am just grateful to work with so many great people on this project and be helping whales have a great effect on making Steemit's content more diverse, while also rewarding/encouraging authors who need help getting noticed. Have you seen any improvements so far since you started the project? Yes, certainly. The Trending page of Steemit has many more posts from undiscovered and emerging authors now. They are not usually in the Top 10 or even Top 20 (what I call the "VIP section"), but below that many of the writers, painters, photographers, poets, chefs, and others we find are getting more exposure. And as the community finds them, we are seeing a few each day who rise from that group and break through onto the Trending page. So Steemit is becoming more diverse and more people are getting rewarded for their high quality content. It's a win-win situation. We don't want to grow Project Curie too big, but we hope to add a few more whale accounts on a different set of posts, so that we can reach more deserving authors than we can get right now. It's making a huge difference so far. What do you think as to be put in place by the co-founders to better retain new users? The co-founders and development team are doing amazing work with Steemit. I look forward to their next round of work to continue building out the Steem ecosystem. Personally, I think Steemit as currently designed is operating quite well internally. It's not perfect, but we're finally starting to see greater diversity and rewards going to emerging authors. I don't think we need a lot of internal changes right now, which often create more controversy than they're worth; we just need to let it develop organically so that more communities can form around tags and languages and interest areas. I would look at the external audience and how we can get them here: friendly site, sign ups, apps, some retention programs of some sort. I'd love to have some sign-up system for mentoring programs and somehow assign people to groups where there was a person who could work with them to become more successful in creating content. Mentoring is time-consuming work, it's drudgery, but it's rewarding, too. I spend much of my time mentoring. And we need good people to help mentor others in many genres. For example, I don't know much about art, but if someone starts posting on Steemit who clearly has talent but doesn't understand how to organize and present a good post, I can send them to @fairytalelife and her mentoring channel. I would like to have a formal support and mentoring system baked into the website. Where do you see Steemit at the end of the year in terms of contents and users' retention rate? While I'd like Steemit to catch on like wildfire and go viral, steady/natural growth is fine also. @anwenbaumeister and I are looking at some ways to bring it to more college and university students, who are starting back to school now. We can get a lot of exposure if people share Steemit with their friends and young people are good at launching trends. I love that Steemit has become the go-to site for Bitcoin and cryptocurrency people as well as anarchists. But to grow big we'll need many more communities like those joining us. One good thing about having a low Steem price is that it hopefully encourages strong hands. We should have a period where people who believe in it + more investor-types can buy in. And the really great thing is that anyone who earns rewards or invests suddenly becomes a stakeholder. That gives them reason to help us build it, so once they are in, there are more people rowing our boat and driving it forward. Also, I think the other pillars of the Steem ecosystem will be good additions when they come. This thing will be like one giant octopus with tentacles reaching all over the online economy, drawing people in, synergistic and more than a sum of its parts. Beyond the money, this is free content, free from corporate control and government oversight to a large degree. This is already proving to be a very cohesive and fun community, which will grow in many more interesting ways when we have those other pieces available also. Thanks @donkeypong for taking the time to do this. SteemMag wishes you all the best. Thanks @mammasitta. Glad to see you around again. If there is any idea you would like SteemMag to feature, I would love to hear from you. Please interview more anarchists , awesome women ! I am still looking and searching for cutting edge articles . I've been a bit boring recently because not inspired enough but I am collecting ideas meanwhile . Keep up your great work ! Yeah, especially the part about mentoring. The steemmag is really nice for a new steemian like me inforvore! I come across a lot of these topics but either don't get enough information or don't know which ones will catch on. Putting them in the steemmag not only legitimizes them but also gives a quick insight into what some of the people involved are thinking. Thanks again, and keep up the good work. Thanks so much. You perfectly captured the reason why I started SteemMag. Giving quality info to steemians at the comfort of the weekend. Hey, I am new here.. 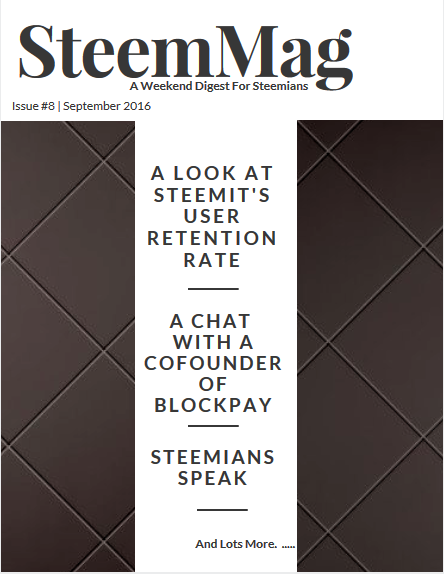 Although I haven't read the previous editions of the steemmag, I am now compelled to give it a look. This article has so much good information in it. Looking forward to read some other content of the site. Thanks for the compliment. And you should try go through the previous editions. Reading them will give you a feel of the issues that have been deliberated on Steemit over the months - a short mini-course on the history of steemit. I like that.. its really like a short cash course or training to get upto speed with steemit.. This digest is great in that it gives us an insight to the thinking of movers and shakers in the steemit community. I don't think the RHW initiative can be praised enough for what it is doing for people! Thanks so much. I'm happy you find so much value in the interviews. Motivates me to get more awesome people to chat with. @infovore I am on Steemit 3 weeks now and this is the first time I have come across your weekend 'SteemMag'. May I both thank and congratulate you on such excellent and valuable content. I will be sure to read all the previous editions. Although only a 'minnow' I have spent most of my time so far on Steemit commenting on and upvoting others posts. I feel a little encouragement in these initial stages goes a long way, and to echo the old adage, it is easier to keep a 'customer' than get a new one... so yes, I would wholly agree that user retention and consolidation is a vital and primal aspect of the platform at this beta stage. Happy to be a mentor now or in the future. I have over 30 years teaching experience and am a successful online course creator. Likewise, happy to curate on behalf of Project Curie or Robinhood Whale initiatives. I am based in Western Europe and work from home, online about 14 hours a day on average, so if you are having probs currently filling the European evening hours slot, give me a shout on chat. Cheers! I think the best and unique thing about a social network is the debates, discussions and interactions. If you succeed making people more involved in the subjects and debates, it will be good. Thanks for all the good information. I'm new and trying to read and learn all I can. Thanks for these great and informative interviews. I think that the robinhood whale project is a good initiative. It will unearth new and emerging authors, reduce their frustration and will also contribute to higher retention rates. These are fantastic! Thanks for putting them together! And cool to see myself in there.